Advanced Office provides San Bernardino companies with the best value in copier and printer sales, leasing, rentals, and service. Over the last 30 years, we've served the office equipment and workflow optimization needs of more than 30,000 companies. Our clients include law firms, schools, non-profits, banks, hospitals, mortgage firms, insurance agencies, construction companies, and many others, throughout the Inland Empire, Los Angeles, Orange County, and San Diego areas. With our years of experience and level of expertise, we have the ability to design custom print management solutions for San Bernardino companies of any size and from any industry. Advanced Office specializes in new and refurbished printers and copiers made by Ricoh and Lexmark. These award-winning manufacturers are widely recognized among the digital imaging industry as well as commercial consumers for their exceptional office automation products, which are extremely reliable and highly durable. They not only produce high-quality prints, but operate at surprisingly fast speeds. 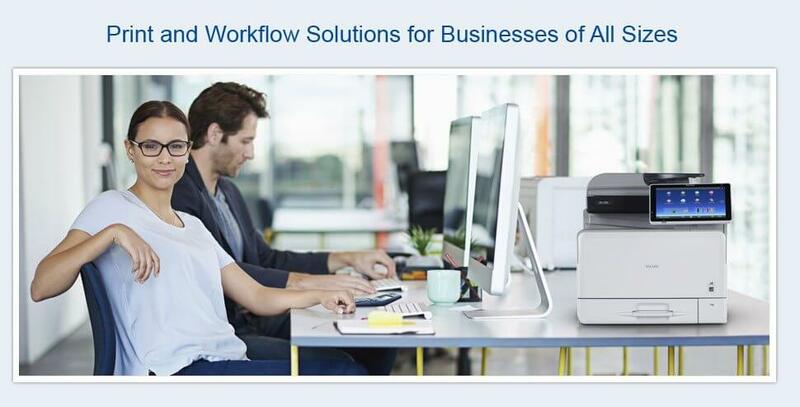 By offering these high-performance printing and copying machines at great prices with a variety of purchasing, leasing, and renting options, San Bernardino businesses find that they not only increase their productivity but also save money when they work with Advanced Office to optimize their internal workflow. At Advanced Office, we're invested in the long-term satisfaction of our San Bernardino clients. This means we'll take every opportunity to prove to you that your satisfaction is our top priority. From properly matching you to the best printer, copier, or other office equipment for your needs and budget, to providing the highest quality, most cost-effective service and maintenance agreements you can find in San Bernardino--you'll discover that we comprehend your needs and have designed our services to fully meet them. Call today for a free workflow analysis and learn more about our Ricoh and Lexmark products, financing options, and service agreements. We can also develop custom software solutions to fit most budgets. 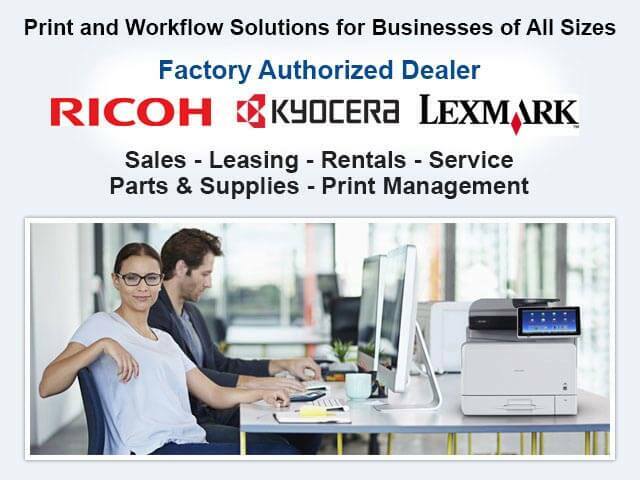 Advanced Office is a fully authorized, leading Ricoh and Lexmark copier dealer. Over the last 30 years, copier leasing, sales, rentals, and service have dominated what we do. By offering great rates and flexible financing options, we make it possible for nearly any San Bernardino business to afford one of Ricoh's or Lexmark's high-performance copiers. 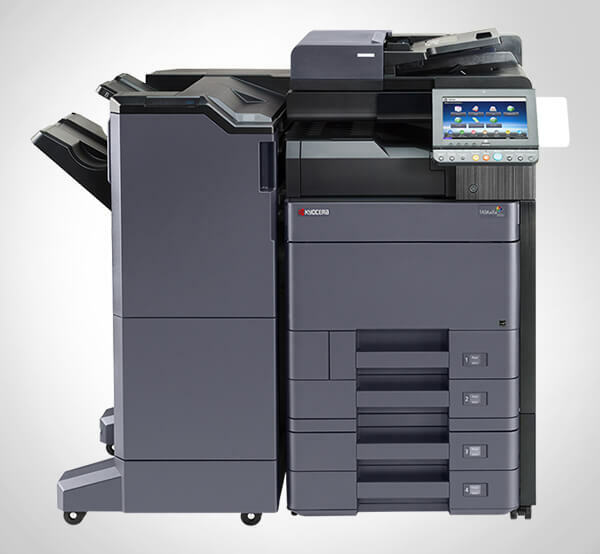 These versatile machines have the ability to print, scan, and fax as well as copy. They can also feature finishing functions such as folding, ring binding, hole punching, stapling, and collating, and custom document management software. To discuss your copier needs, call and speak with an Advanced Office sales consultant today. Our consultants average nearly 15 years of industry experience and are experts in determining which machine will best serve a company's unique needs. Advanced Office sells and leases Lexmark and Ricoh single-function and multi-function printers to San Bernardino businesses. Our commercial clients have been coming to us for over three decades because we offer the finest lines of printers, a wide range of payment options, and world-class service. By investing in a Ricoh or Lexmark printer, you'll benefit from greater reliability, faster printing speeds, and reduced printing costs. Additionally, we can maintain your Ricoh or Lexmark printer with cost-effective, all-inclusive service and supply agreements. Ricoh and Lexmark printers print in color, black and white, or both, and can come with a wide variety of features, such as duplexing, high-capacity paper trays, specialized software, and more. Call today to speak with one of our printer experts about the best brand and model for your needs in San Bernardino. For San Bernardino businesses looking for our best deal on high-quality copiers and printers, Advanced Office offers an assortment of refurbished Ricoh and Lexmark copiers and printers at budget-friendly prices. Our refurbished stock consists of equipment that has come right off of our short-term leases and rentals, and shows little to no wear and tear. We then install new toners and replace heavily used componentry with all-new parts. Additionally, all refurbished printers and copiers must pass a comprehensive 60-point inspection before we certify them for resale. To learn more about our current refurbished inventory, call today. Advanced Office has years of experience and training in helping San Bernardino businesses determine the best production printer for their needs. 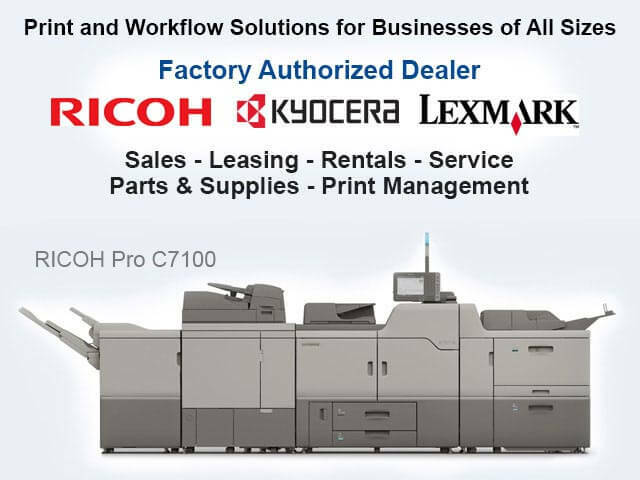 As a factory approved Ricoh dealer, we specialize in offering Ricoh's full line of production printers, including those made by related brands Lanier, Gestetner, and Savin. These printers are known for producing large quantities of high-resolution prints quickly and affordably. All Ricoh production printers feature long-lasting components and a number of finishing options, such as high-volume hole punching, saddle stitching, stapling, trimming, collating, folding, and more. For the right San Bernardino business, production printers can save your office time and money. To learn more about these state-of-the-art products, call and speak with one of our sales consultants today. 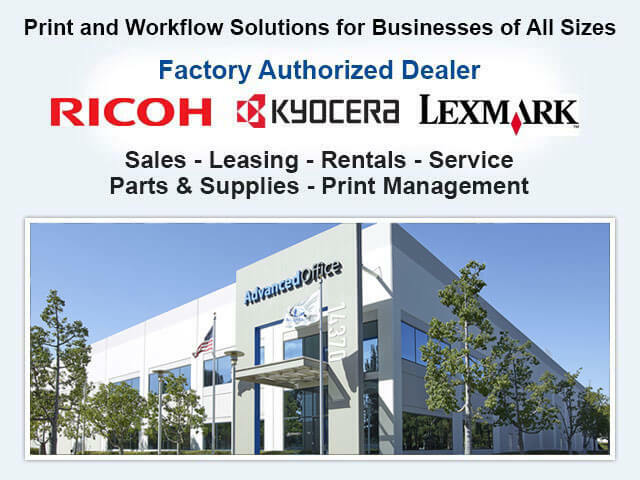 Advanced Office is San Bernardino's preferred source to buy, rent, and lease Ricoh wide-format printers. In addition to special pricing and a variety of financing options, we also offer personalized service and expert advice to help San Bernardino's businesses determine which Ricoh wide-format printer will best suit their unique needs and budget limitations. Wide-format printers are ideal for builders, engineers, contractors, architects, and other businesses that frequently need to print, scan, and/or copy oversized documents. Ricoh's wide-format printers give San Bernardino businesses the capacity to produce astoundingly high-quality prints--quickly, conveniently, and cost efficiently. Call today to schedule your free onsite analysis. 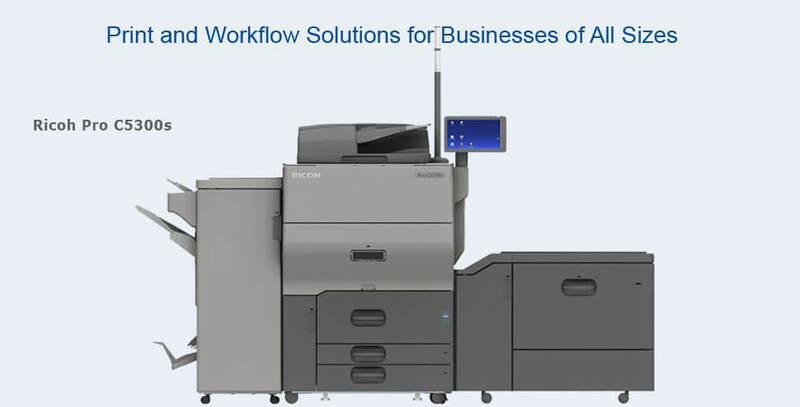 Advanced Office sells, leases, and rents Ricoh, Lanier, Savin, and Gestetner digital duplicators to San Bernardino area schools, hospitals, churches, nonprofits, universities and commercial businesses at cost-effective prices. Digital duplicators utilize stencils, spinning drums and ink (instead of toner) to generate high-volumes of prints at a very low cost per page. For many clients who frequently produce large quantities of single-page documents, forms and flyers (generally in black and white), digital duplicators are a great investment. They'll not only withstand years of high-production printing but also produce prints much faster than most laser printers and at a lower cost-per-page. Call today and learn more about the benefits of our digital duplicators as well as our service and financing options.